Credit: NASA/CXC/Penn State/S.Park et al. 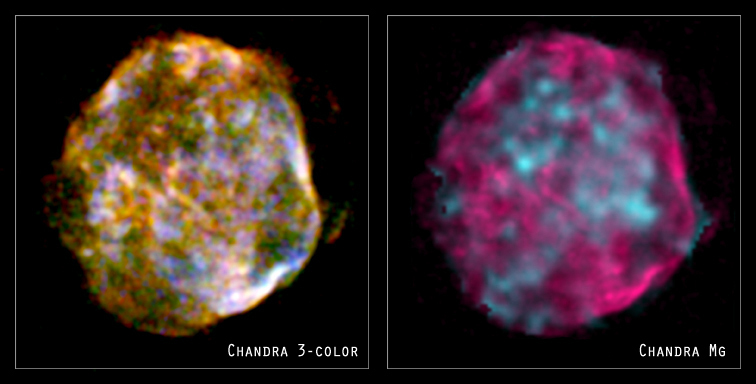 The Chandra image of N49B (left), the remains of an exploded star, shows a cloud of multimillion degree gas that has been expanding for about 10,000 years. A specially processed version of this image (right) reveals unexpectedly large concentrations of the element magnesium (blue-green). The amount of magnesium in N49B is estimated to be about equal to the total mass of the Sun. Since the Sun contains only about 0.1% of magnesium by mass, the total mass of magnesium N49B is about a thousand times that in the Sun and its planets. Magnesium, the eighth most abundant material in the Earth's crust, is a mineral needed by every cell of our bodies. It helps maintain normal muscle and nerve function, keeps heart rhythm steady, and bones strong. It is also involved in energy metabolism and protein synthesis. Fortunately for us, and thanks to stars such as the one that produced N49B, there is an abundant supply of magnesium in the Universe. Credit NASA/CXC/Penn State/S.Park et al. 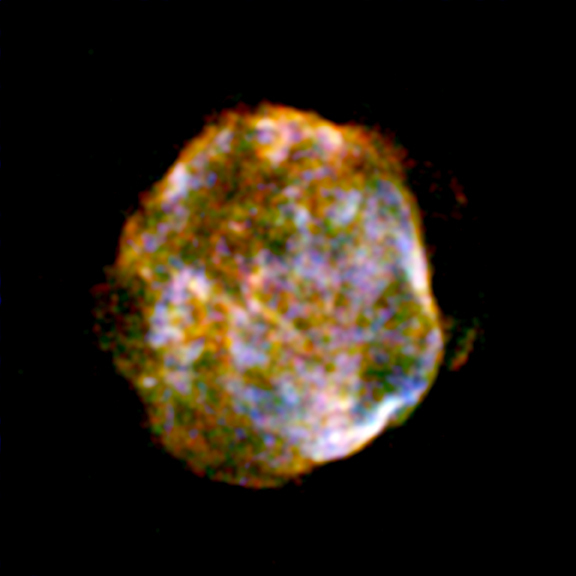 Scale Image is 3.3 arcmin across. Coordinates (J2000) RA 05h 25m 26.04s | Dec -65° 59’ 06.90"